The STB-1 is a Rank V Japanese medium tank with a battle rating of 7.7 (AB/RB/SB). It was introduced along with the entire Japanese Ground Forces tree in Update 1.65 "Way of the Samurai". 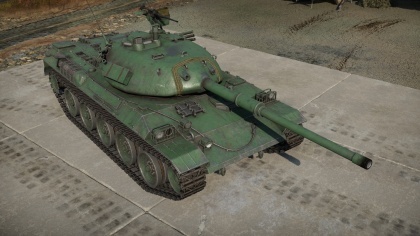 The prototype of the Type 74, the STB-1 presents many features that would be in the final design. 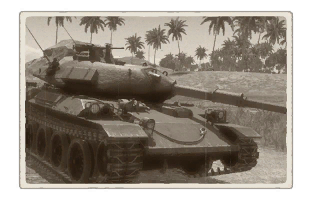 The STB-1 is the first researchable tank in Japan's Ground Forces Rank V. Despite having considerable more armour than its comparable counterparts the Leopard 1 and Leopard A1A1, as well as comparable mobility, it is not recommended as a front-line tank like the 'Allied' counterparts. Instead, a cautious hit-and-run tactic like the Leopards should always be employed. Using the tank's hydropneumatic suspension correctly can help with the tank's depression, and in some cases, aid in survivability. Do note that the L7 on this tank reloads significantly longer than other L7-equipped tanks. The STB-1 is unique among being one of the only Japanese tanks that can take a hit, like the Type 4 Chi-To Late and Type 5 Ho-Ri Production. It has thick frontal hull armour that can bounce shots effectively, but should not be relied on. The tank is quite fast and is further aided by the Hydropneumatic suspension, which allows this tank to manoeuvre the battlefield much like a Leopard, however the abundance of larger, more open maps at higher ranks means that getting from point A to B - and not getting shot - is not a simple as it sounds. Driver's vision port on the front glacis are only 50 mm thick. Hull roof is rated to be 54 mm effective against HE. The STB-1, while often compared as a 'better' Leopard 1, should still be treated carefully as a tank. Aggressive play is not unsafe and can be very rewarding at times. Keep in mind the STB-1 has a chance of bouncing, but most shots in the turret result in loss of horizontal turret drive, cannon breech, or essential crew. The STB's biggest threats are agile vehicles with fast reloads. Due to a reload that is longer than many other tanks you want your first shot to disable their gun. Highly mobile, comparable to the German Leopard I. More armour than the German Leopard (around 100m hull and turret). 105 mm L7 cannon found on other NATO tanks. Utilization of hydropneumatic suspension allows for various offensive and defensive options. 12.7 mm Browning Machine Gun. Other areas are lightly armoured, vulnerable to high penetrating SPAA. Reload and top speed slower than Leopard. Engine vulnerable to some aircraft with powerful guns. The prototype for the Type 74. Known in Japanese as 74式戦車の試作車STB-1 (ななよんしきせんしゃのしさくしゃSTB-1). Created in September 1969 along with STB-2 in the STT program. Due to issues with cost effectiveness these two prototypes were not considered for the replacement of the Type 61. In a bid to reduce costs STB-3, STB-4, STB-5 and STB-6 were produced between April 1970 to December 1971. The final judgement for the STT program was held in November 1973 which lead the line to be completed in 1974. And, production started the following year in 1975 for the Type 74. This page was last edited on 26 March 2019, at 06:23.